The optimal surgical management of sylvian arachnoid cysts is debated. We present our experience in children who were treated endoscopically, focusing on the limits and complications of this approach. 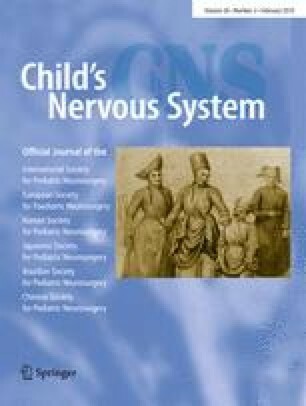 Seventeen children with a temporo-sylvian arachnoid cyst have been treated using a purely temporal endoscopic approach. In all but one case, the recognition of anatomical landmarks was obtained at the insertion of the endoscope. In one child, the orientation and opening of the basal cisterns were more difficult due to the thickness and opacity of the membranes. Nevertheless, it was possible to perform the cysto-cisternostomy endoscopically in all children with several stomies in 13. In one child, a venous bleeding occurred. There were no other intraoperative complications. There were no postoperative cerebrospinal fluid leaks. In two patients, a symptomatic subdural collection developed which required a transient subdural-peritoneal shunt. No subdural collection was noted on a delayed follow-up (mean, 23 months). Preoperative symptoms related to the mass effect exerted by the cyst resolved in all children. Two children presented a recurrence, 12 and 20 months after endoscopic surgery, respectively. At the redo-endoscopy, the stomies were found to be closed. Their reopening resulted in the disappearance of the symptoms. An endoscopic approach can be used safely in the management of sylvian arachnoid cysts. An effective opening of the deep arachnoid membranes into the basal cisterns could be performed in all patients with the resolution of the preoperative symptoms. However, the long-term efficacy of the stoma needs to be assessed.